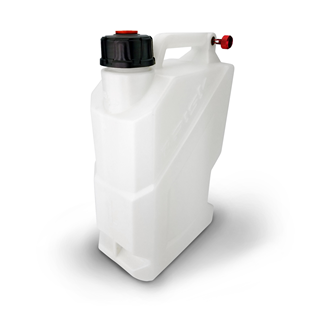 Risk Racing is proud to release their latest innovation, the EZ3 Utility Jug. The EZ3 is a visual standout among most jugs on the market. The sharp and aggressive design is certainly eye catching, but Risk Racing doesn’t stop at looks. Risk has identified the challenges surrounding utility jugs, and developed smart solutions to make life easier when dealing with fluids. This jug solves the trials and tribulations common with transport, pouring, and even venting. The EZ3 Utility Jug is exactly what the name implies. It is a 3 Gallon (10 Liter) Utility Jug that is simply easy to use. It has a triple handle design that is completely unique. The top handle and side handle are obvious, but it is the third fingertip handle at the front of the jug that comes in handy during the end of the pour. This triple handle design allows the user to carry and pour at any angle with comfort and control. Carry and pour with confidence knowing that the EZ3 is constructed from thick-walled, high-density, polyethylene plastic, ensuring it is durable enough to hold up to any fluids you may transport. Finally, Risk Racing has 2 innovative spouts to choose from which complement the EZ3 jug, and further enhance the user experience. Customers can choose to pair their EZ3 with the new Hose Bender spout, which positions the hose in the perfect pouring position. Or they can choose the Flow Control which has the hose bender feature, but also the Auto Shut-off spout.